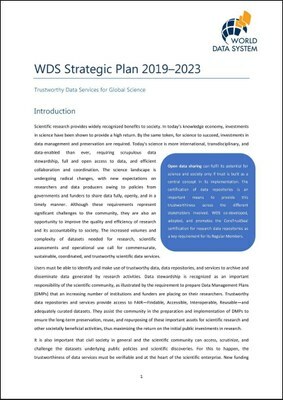 At its 17th (30 September–01 October 2017; Tokyo, Japan) and 18th (19–20 April 2018; Rio de Janeiro, Brazil) Meetings, the WDS Scientific Committee (WDS-SC) began formulation of a Strategic Plan for WDS for the period 2019–2023. Alongside this document, it also generated an Implementation Plan listing Actions towards achieving the proposed Strategic Targets. Inviting comments from the ISC Governing Board and ISC Members on both texts, the SC returned to the drafts at its 19th Meeting (12–13 November 2018; Cape Town, South Africa), and continued to refine their content. The associated Implementation Plan is a dynamic, online resource that can be updated by the WDS-SC as required. The present version of the Implementation Plan can be viewed through the following link: Implementation Plan 2019–2020.